Melanie has accomplished so much here at Kore! She shows up for classes, she puts amazing effort in, and she has seen the results! I mean look at that plank! How did you start your overall journey? “I did the winter weight loss challenge, and it helped me with all the mental parts of eating and exercising. All the negative things we tell ourselves that keeps us from better choices. I have always had motivation and consistency problem. The classes at Kore have been really helpful because its like working with a trainer. Kelly, and all the other instructors have been tough and encouraging. I need that. I have started to lose weight, and my mood has really improved.” Wow, this is awesome! Not only has her weight improved but her overall confidence and mental state! What has Kore done for you? 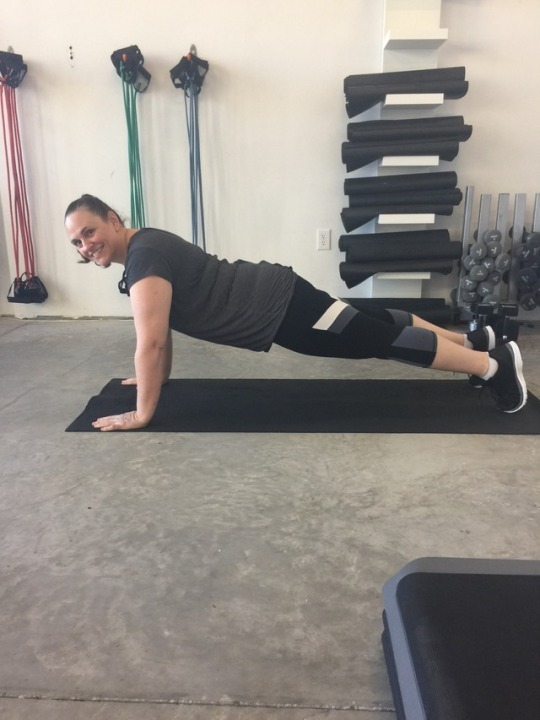 “Kore has given me the incentive to get myself off the couch and to move. Its a lot easier to talk yourself out of exercising when you go to a large gym with machines. Kelly, and the other instructors I see keep me motivated. The weight loss challenge really helped me to stop with all the mind trips I play on myself. Im working on taking it one day at a time. The weight loss group was enlightening for me because I saw that pretty much everyone tells themselves the same things that keep them from progressing. It really helped me to stop beating myself up.” This is so important to stay active! How do you feel in the classes versus when you started? We at Kore support Melanie 100%! Her mindset, attitude, and physical being has changed from lifestyle choices. We hope that you all get to experience the wonderful effects of healthy living as well.